Surely one study can’t be this important? It’s not news that the Washington Post’s editorial board has been lobbying against Sen. Bernie Sanders since the beginning of his improbable presidential campaign. Sometimes this editorial ethos seems to extend to other parts of the paper, as it did in March, when the Post managed to run 16 negative stories about Sanders in 16 hours (FAIR.org, 3/8/16). The study was irresistible for editors looking for viral outrage: huge, scary national debt numbers by a tax-and-spend liberal (entirely without any context), complete with innuendo that the campaign had been lying about its projections. Indeed, the Washington Post loves to frame differing opinions about policy costs as deception, with an editorial back in January tabloidishly headlined “Mr. Sanders Needs to Come Clean About the Funding for His Healthcare Plan” (1/19/16). He can’t just have different numbers in good faith; he must be hiding something. This presumption of bad faith was on display with the first hot take—“Sorry, Bernie Fans. 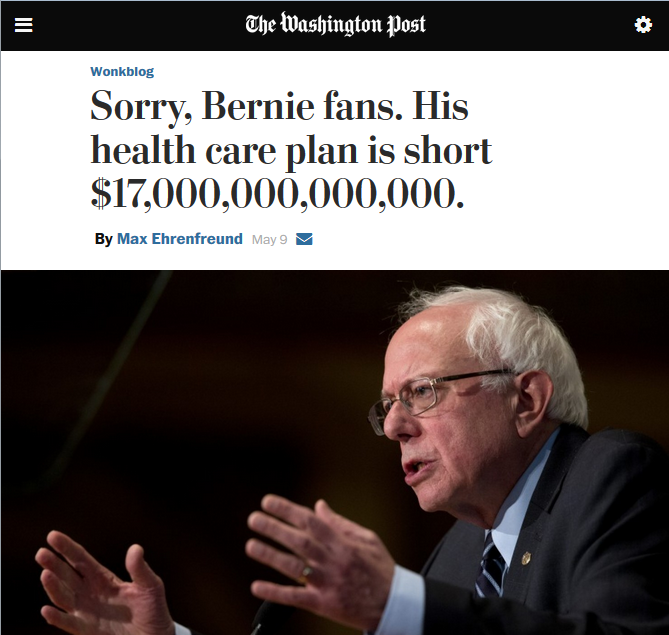 His Healthcare Plan Is Short $17,000,000,000,000” (5/9/16)—by Max Ehrenfreund.  (Dozens of articles were published on the Urban Institute study on or around 1 pm Eastern, indicating that the story was embargoed until that time.) The Washington Post doesn’t usually write out all the zeros in large figures, but it’s important that big, scary numbers look as big and as scary as possible. 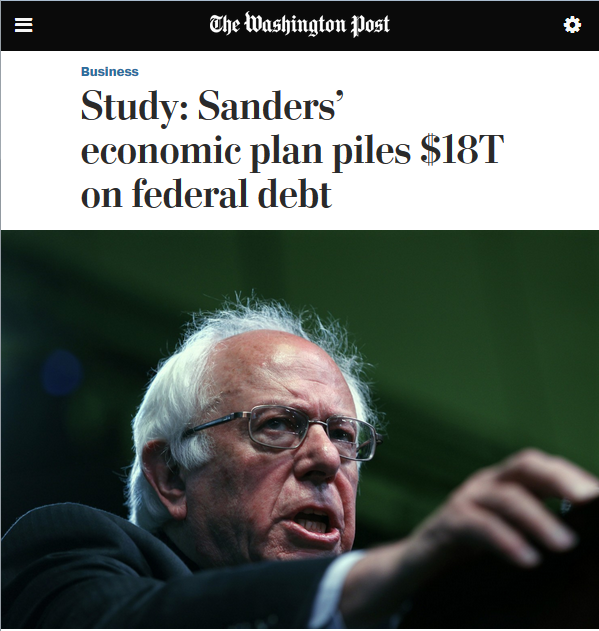 From the smug, provocative headline to the uncritical write-up of the study, the overarching theme that Sanders was hiding the true costs of his social programs was simply taken for granted. 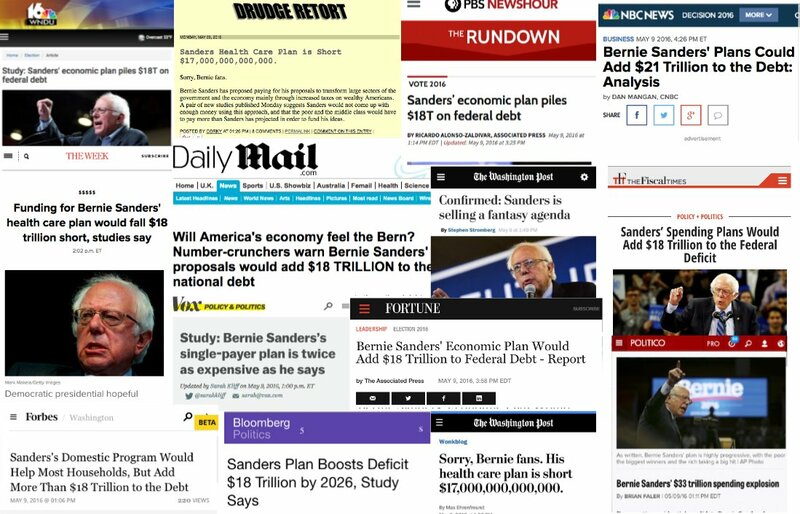 Since progressives aren’t supposed to care too much about deficits, the story’s hook had to be the implication of deception—that somehow Sanders was concealing his socialist plot. For context, when the Urban Institute’s Tax Policy Center did a breakdown of Hillary Clinton’s tax policies on March 3, the Washington Post ran two stories, both broadly positive, like the study itself. Since the Institute also released a critique of Sanders around the same time, the Post also ran comparisons, but none solely focusing on Clinton that were critical. Depending on the target audience, the ideology of the study’s publisher, the Urban Institute, also changed. To the Post, it’s “nonpartisan,” while the nominally hipper Vox (“Study: Bernie Sanders’ Single-Payer Plan Is Twice as Expensive as He Says,” 5/9/16) described them as being “left-leaning”—though to depict an organization funded by the likes of Bill Gates, Pete Peterson and JPMorgan Chase as leaning “left” is to render the description meaningless. Traditionally, the Urban Institute has been considered “liberal,” but this has always been a loaded notion, that pro-Democrat equated to progressive. The Urban Institute’s president, Sarah Rosen Wartell, worked in the Bill Clinton White House and co-founded the Center for American Progress in 2003 with Bill Clinton’s chief of staff and Hillary Clinton’s current campaign chair, John Podesta. The State Department, while under Clinton’s charge, donated millions to the Institute (as it did before and after her tenure). Considering Sanders is expressly running against the “Democratic establishment,” it’s no surprise that a scion of this establishment like the Urban Institute would oppose Sanders’ (relatively) radical measures. 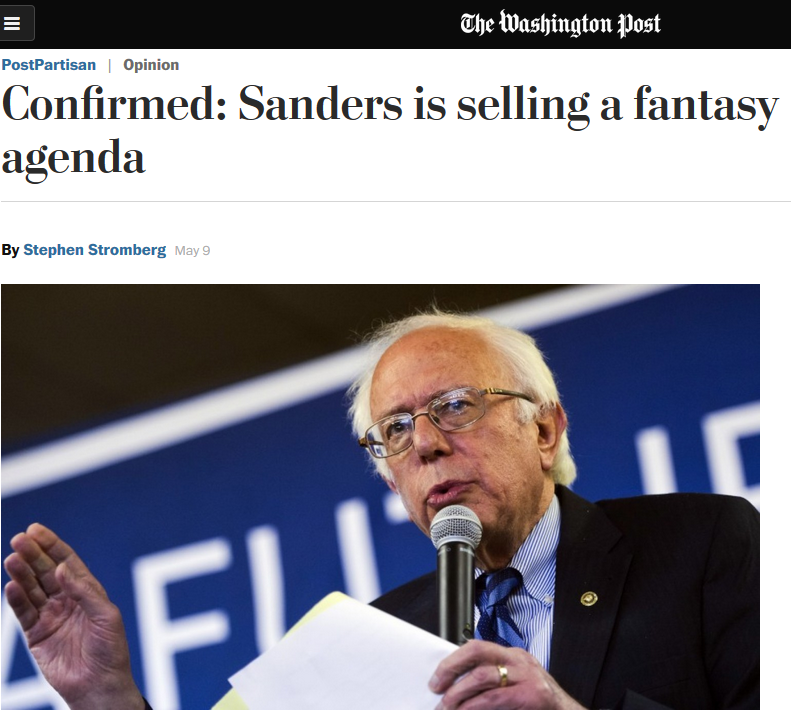 Stephen Stromberg joined Ehrenfreund in the hot take department with his confidently headlined “Confirmed: Sanders Is Selling a Fantasy Agenda” (5/9/16). The piece similarly recapped the Urban Institute study uncritically. Neither writer included comment from the Sanders campaign. Himmelstein and Woolhandler note that the Urban Institute report assumes there will be 100 million more doctor visits per year, despite the fact that the plan does not involve an increase in the number of doctors. The Urban Institute report supposes that the US single-payer system would pay 50 percent more for prescription drugs than Medicaid currently pays, and ignores or minimizes administrative savings from a unified system that add up to $6 trillion over ten years. Sen. Bernie Sanders’ tax and spending proposals would provide new levels of health and education benefits for American families, but they’d also blow an $18-trillion hole in federal deficits, piling on so much debt they would damage the economy. This was accompanied by a sinister photo of Sanders leering over an audience. That’s an internal matter for Democrats, to be sure, but also of interest to anyone who believes that political parties should offer realistic solutions. In that sense, the prospect of a Sanders-ized platform is cause for concern. Mr. Sanders’ offerings to the American people are, quite simply, too good to be true, and much less feasible, politically or administratively, than he lets on. More expensive, as well. Why would so much ink be spilled on a candidate who, by the Post’s estimation, can’t possibly win? The objective is, of course, to further stigmatize Sanders ideas and platform goals—all of which are deeply antithetical to the editorial and financial bottom line of the paper and its sole owner, Jeff Bezos, whose net worth is over $45 billion. It’s not enough for Sanders to lose, as the Post’s editorial board has been expressly rooting for for months; his ideas and the influence he maintains in the party must be snuffed out as well.